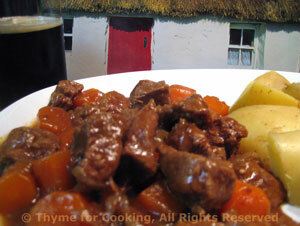 Thyme for Cooking Weekend Menu: Beef Braised in Guinness, easy recipes. You can substitute any beer for the Guinness if you can't get it, a full-bodied dark beer would be best. You should be able to buy it by the (large) can. Buy an extra to drink with dinner.... This is an easy dinner - start it, then ignore. A classic for St. Patrick's Day but a great cold-weather dish anytime. Slow braising makes the beef meltingly tender and the beer adds a robust flavor. Serve with 'Jacket Potatoes': potatoes baked in their skin and a staple in Ireland. This makes enough for 4 or 2 meals for 2. Cut beef into 1" (2.5 cm) cubes. Cut onion into quarters, then slice thinly. Cut carrots in half the long way, then into 1" (2.5cm) pieces. Combine paprika and cornstarch in a plastic food bag. Add beef and toss to coat evenly. In a heavy saucepan or Dutch oven, large enough to hold everything easily, heat oil over medium-high heat. Add onion and sauté until translucent, about 5 minutes. Add garlic and sauté 1 minute more. Add remaining ingredients, bring to a boil, reduce heat to low, cover and simmer at least an hour. If it starts to dry out, add more Guinness or beef stock. Traditional baked potatoes, very simple, always tasty. I can only get thin-skinned, waxy potatoes so I boil them, skin on. If you can, get a proper baking potato and bake in their 'jackets'. Cooking times depend on size. 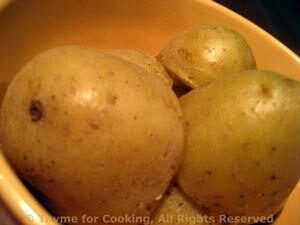 Scrub potatoes, poke a few holes in with a fork and bake, 400F (200C) until done, about 40 - 60 minutes. Or, cut in half or quarters, and boil, covered in water, until tender, 20 - 30 minutes. Check beef - simmering nicely? Does it need liquid?